A group with ties to Senate minority leader Chuck Schumer (D., N.Y.) announced on Friday it would launch a $600,000 media buy targeting Republicans over the government shutdown, seeming to confirm the notion that Democrats are "playing politics" with the impasse. Majority Forward, a 501(c)(4) "social welfare nonprofit" that isn't required to disclose its donors, will run 30-second ads on broadcast and cable television in an effort to pressure six Republican senators up for reelection in 2020 to cave and end the shutdown. The ads, which will air in Arizona, Colorado, Georgia, Iowa, Maine, and North Carolina, are designed to appeal to voters by incorporating specific effects of the shutdown unique to each state, as first reported by the Washington Post. "It's the longest government shutdown in history … and here in North Carolina, the shutdown's forced a slow down for hurricane recovery," says the narrator of the ad targeting North Carolina's Republican senator Thom Tillis. "Instead of being independent he sides with his party's leaders, who refuse to even allow a vote to reopen the government." "Tell Thom Tillis [to] put North Carolina over party and demand an end to the shutdown," the ad concludes with a number for the senator's Capitol Hill office. The shutdown, which entered its 27th day on Friday, doesn't appear to be heading toward a conclusion any time soon. Schumer and his House counterpart, Speaker Nancy Pelosi (Calif.), have been adamant that any deal to reopen the government does not include President Donald Trump's request for a $5 billion appropriation to fund construction of a wall on the U.S.-Mexico border. In response, the president has accused the Democratic leadership of "playing politics" not only with the federal government but with border security as well. J.B. Poersch, the president of Majority Forward, claimed on Friday that his group was motivated to run the ads with no other desire but to see the shutdown end. "These Republican senators refuse real action while the repercussions of a closed government set in and have economic consequences for frustrated Americans," he said in a statement announcing the media buy. A number of the Republicans being targeted for refusing "real action" have already expressed support for ending the government shutdown. In fact, Republican senators Susan Collins (Maine) and Corey Gardner (Colo.) were one of the first to signal they want the government reopen regardless if border funding is part of the deal. Others, like Tillis, have argued for ending the shutdown and addressing the status of individuals under the Deferred Action for Childhood Arrivals program afterward. There is also debate as to Majority Forward's relationship with Schumer, who is central to shut down talks. The group, which spent more than $40 million boosting Democratic Senate candidates during the 2018 election cycle, shares office space and staff with Senate Majority PAC—Schumer's outside fundraising vehicle. 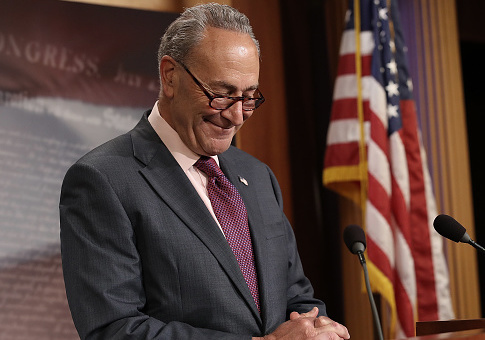 The president of both organizations, Poersch, is a noted Schumer confident since his days as executive director of the Democratic Senatorial Campaign Committee. Under Poersch's leadership, Majority Forward has taken a more proactive approach in pushing Schumer's agenda. On Friday, it became evident that the ads being run by Majority Forward would be used for political purposes regardless. 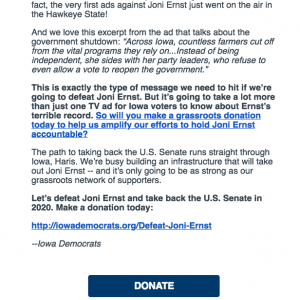 A fundraising email obtained by the Free Beacon shows that the Iowa Democratic Party is already relying on the ads in their quest to defeat Republican senator Joni Ernst. "We’re going to be saying this A LOT over the next 22 months, so get used to it: if Democrats have any shot at taking back the United States Senate, we have to defeat Iowa Republican Joni Ernst," the email read. "Here in Iowa, we’ve known that for months. But thankfully, Democrats around the country are starting to realize that. 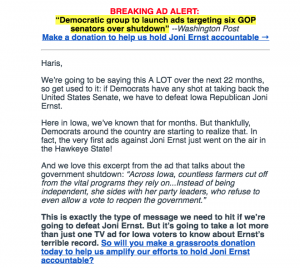 In fact, the very first ads against Joni Ernst just went on the air in the Hawkeye State!" "And we love this excerpt from the ad that talks about the government shutdown: ‘Across Iowa, countless farmers cut off from the vital programs they rely on…. Instead of being independent, she sides with her party leaders, who refuse to even allow a vote to reopen the government.'" "This is exactly the type of message we need to hit if we’re going to defeat Joni Ernst. But it’s going to take a lot more than just one TV ad for Iowa voters to know about Ernst’s terrible record. So will you make a grassroots donation today to help us amplify our efforts to hold Joni Ernst accountable?" Majority Forward did not return requests for comment on this story. This entry was posted in Politics and tagged 2020 Election, Chuck Schumer, Senate. Bookmark the permalink.